We are excited to announce the call for abstracts for the 2017 SOMENS Conference. The conference will be held at the Hotel Indigo in downtown Athens, Georgia (http://www.indigoathens.com) from Sunday, October 22 to Wednesday, October 25, 2017. We would like to open the call for abstracts for the 2017 SOMENS meeting around any area that is related to forestry measurements, modeling, inventory, growth and yield, planning, analysis, etc. Abstracts are due Friday, September 1, 2017. Please email them to the conference organizers; emails listed in the registration information. We have tried to keep the student rate low to encourage student participation and presentations. We will have a shorter presentation format for students so that those that are early in their research programs will still have an opportunity to present and get feedback. A block of rooms has been reserved at a discounted rate of $109 per night (plus taxes/fees). You must book by 9/22/17 to get this rate. Call the hotel directly (866-808-1483) and reference the SOMENS 2017 Conference (room block code: WAF) or go to their website using this link that has the group code embedded ( Hotel Indigo Athens - SOMENS Conference) and click “Book Now” and enter the requested dates 10/22-10/25. If you want to stay longer at that rate, call the hotel directly or email one of us to put you in contact with the sales manager. Travel: The Atlanta Airport (ATL) is approximately a 1.5 hour drive from Athens. No need to rent a car or deal with traffic, there is a reasonably priced shuttle that will take you from the airport terminal directly to the hotel, and then back again. We’ll be at the hotel for the duration of the conference (or within short walking distance for dinner). 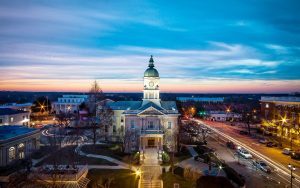 The shuttle service is provided by Groome Transportation (http://athens.groometransportation.com), be sure to indicate you want drop-off and pickup at the Hotel Indigo. 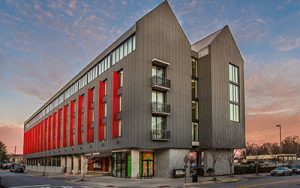 The Hotel Indigo is in the downtown area of Athens, GA and is adjacent to the main campus of the University of Georgia. The Warnell School of Forestry and Natural Resources is a short walk away (though the meeting will be held entirely at the Hotel Indigo).